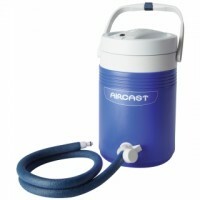 The Aircast AutoChill System connects the Cryo/Cuff Cooler and the AutoChill pump together to allow for ease of use. The pump is attached to the cooler for more mobility. The AutoChill system enhances the Cryo/Cuff with two unique functions: continuous cold and pulsating pressure. Continuous cold eliminates the need for manual water recycling by utilizing an electronic pump to exchange warm water for cold. Pulsating pressure resulting from the automatic exchange of water provides comfort and therapeutic benefits.